Los Angeles County, CA–This Thanksgiving, the Los Angeles County Sheriff’s Department is joining the California Office of Traffic Safety (OTS) to remind people how important it is to wear a seat belt, and the potentially deadly consequences of not buckling up. It is why during the Thanksgiving holiday, which runs from Nov. 22-26, the Los Angeles County Sheriff’s Department will be looking for drivers and passengers who are not wearing a seat belt. 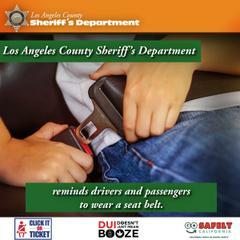 As a primary seat belt law state, California law enforcement can issue tickets to people who fail to wear a seat belt. Violations are punishable by a $162 fine. The Los Angeles County Sheriff’s Department is one of many agencies across the country participating in the national Click It or Ticket enforcement campaign aimed at saving lives by making sure all drivers and passengers get the message to buckle up.